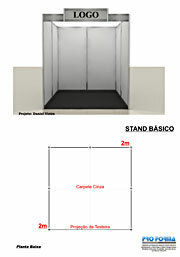 Exhibition space is available in different sizes, the smallest unit starting at 4 m2 (see reservation form). In order to ease the preparation of your participation we have developed a Full Service Package (FSP). It incorporates exhibition space featuring a fully equipped stand at a rental fee of € 255.00 per square meter (incl. all taxes). For reasonable fee, a wide range of items can be added: Additional pieces of furniture, spotlights, electric power supply in 115 V or 230 V, telephone lines, fax, internet, WLAN, etc. Audio-visual equipment (overhead, slide and video projectors, video recorders, etc.) can also be rented. All conference and exhibition facilities are well air-conditioned. Companies bringing their own stand receive a discount of € 55.00 per square meter. Additional meeting rooms for private communication or to arrange workshops are available and can be booked. Tours and excursions to reference projects or investment sites can also be arranged. You are invited to return this form as soon as possible, preferably by fax. Since the stands will be allocated on a first-come / first-served basis, an early reservation will assure your participation at this prime event. The space will officially be reserved in your name upon receipt of a down payment of € 100.00 per square meter and subject to availability of space. The balance must be fully paid before the event. An Information Package concerning transport, mounting and dismantling schedule, order forms for extra items, handling of temporary import facilities, etc. will be dispatched to companies/ organizations, which have transferred the down payment. CEP 22070-001; “ RIO 9 – LAREF 2009”.